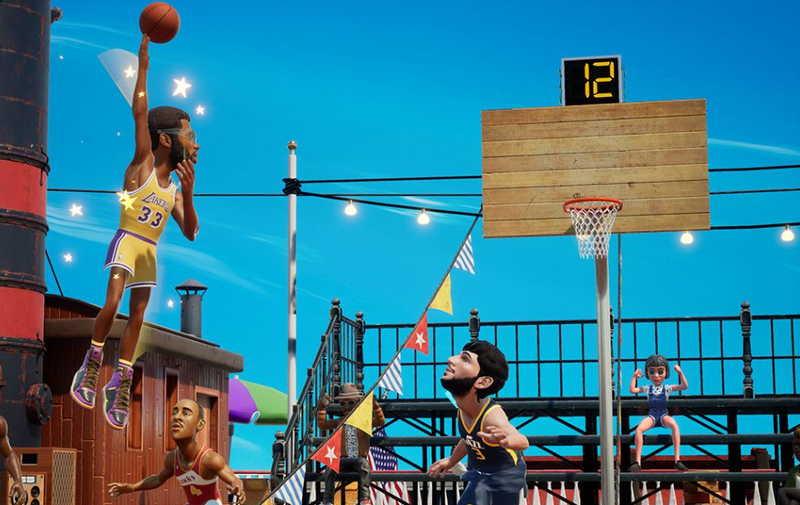 Blacktop, arcade NBA action returns for more power-up, gravity-defying hijinks in NBA 2K Playgrounds 2. There is a plenty of charm and a surprising level of depth in here that should appeal to newcomers and veterans alike. There is a massive roster of characters and some cool options for progressing characters, though the limited scope of the game and the grinding might rub some people the wrong way as well. The first round of Playgrounds was a lot of fun, filling a gaming space that has not seen adequate attention since NBA Jam. There have been a few other arcade style, over-the-top basketball games, but none of them ever captured my attention the way that the old-school fun of NBA Jam did. Don't get me wrong - I enjoy simulation sports (and basketball in particular) as much as anyone else - I have sunk a tonne of time into this year's NBA 2K for example. However, no sport translates as well as basketball does to high speed, arcade style play, and to its credit, NBA 2K Playgrounds 2 nails that. Visually, you have cartoonish characters that somehow still manage to look a great deal like their real-life counterparts. When I was playing with Clyde "The Glide" Drexler or Shaq, they were distinguishable from one another despite being anything but photo-realistic. That is an accomplishment in and of itself, given the roster of hundreds available. If anything, the huge roster of characters is slightly diminished in value because you are only playing two-on-two, not trotting out a starting five and bench that would encourage you to dig deeper into your earned players. Admittedly, some characters fare far better than others, but by and large they look good. Retired legends to the aforementioned, to simply retired lesser players (I love Rich Mahorn for his time on the Detroit Pistons, but no one is going to confuse the guy with a Hall of Famer) to current players as well. These players are acquired a few different ways. You can buy packs of cards (including some you get right out of the gates - that's how I got Clyde right away), winning season championships (unlocking a team's historic star, like Magic Johnson if you win with the Lakers) or going the route of buying out the entire roster in one big shot. See, there are two different kinds of currency. One (Baller Bucks) is far more commonly acquired than the gold coins. You get that just by playing games, but the better gold currency (that can be used to buy everyone) either has to be purchased for real money. Thankfully the actual activities are fun enough that the nuclear option of buying with real money never feels particularly necessary, but it will take a very long time to accomplish. That you are opening packs for your players means you might get duplicates as well, but these can be leverage to make characters better by giving experience to that character. 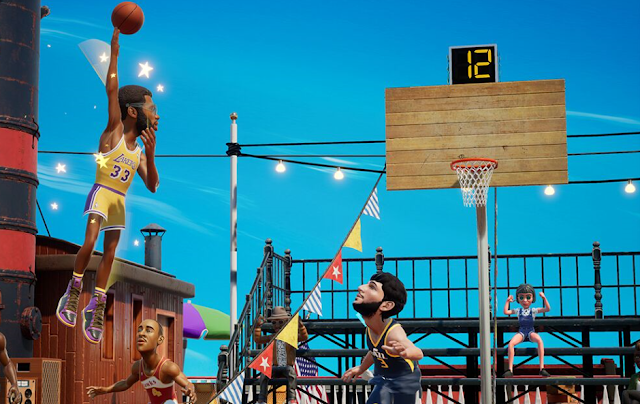 The modes here can come across a bit light, though the ability to play couch co-op is awesome and really when NBA 2K Playgrounds 2 is at its best. 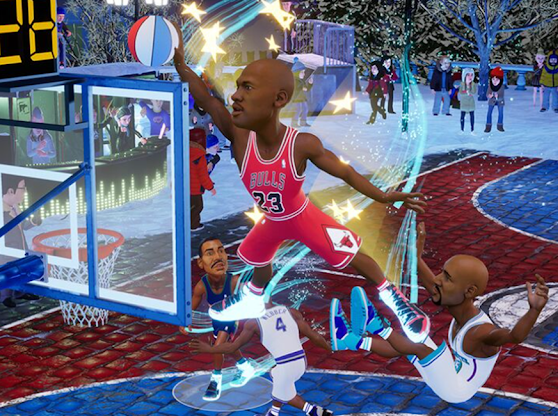 You can play some quick exhibition games, or go for some online play or go into the seasons mode, which is where most of the meat it at. You pick a team (I obviously went with my Pistons) and then progress through a 'season' against other teams. One really fun mode is the three-point contest, but that ties into how entertaining the shooting mechanic is. Most basketball games are focused on timing for their shots, but there is an interesting blend of nuance and accessibility to the gauge that shows up next to your player in NBA 2K Playgrounds 2. Here there is a half-circle with the shot indicator moving across it and you let go trying to target a specific range within it. If you are a great three-point shooter, that target range is wider and when you stop really close to the centre, you will see a fairly high percentage indicated. 80 per cent doesn't mean that the shot is going in, but obviously the likelihood is high. Conversely if you take a beast out to the three-point line, that sweet spot that you need might be really small, and even if you get the shot in there, the percentage might be something abysmal like 27%. Since this mechanic is all you are combating in the three-point contest, it serves as a really solid training mechanism for your favourite perimeter players as well. While shooting the ball is all well and good and a basketball fundamental, there is plenty of over-the-top action to be had in other ways as well. Run, shoot, dunk (often flying way over the rim itself), block and steal (or punch if you prefer) to try and finish your timed game with a high score. 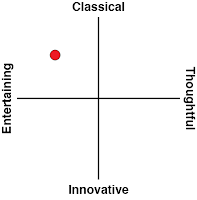 This provides some depth to the gameplay that requires some skills to win. These are the basics, but there are more complex techniques available as well, from alley-oops to yourself off of the backboard, crossover dribbling and back-and-forth alleys with your team mate. While these mechanics all resemble their real-life counterparts in comically exaggerated fashion, you also earn power-ups through playing. 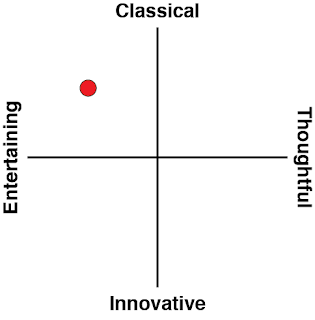 These are triggered through several big plays being performed and eventually triggering a random effect. These range from ice forming over the basket that keeps your opponent's next couple of shots out, to super speed to double points for dunks and a whole lot more. Not all of these bonuses are created equally - anything that impacts the score in a direct fashion is obviously going to be very important, but they are randomised and put on a relatively short timer and available to both teams, so they tend to balance out. If there is a missed opportunity here with the boosts, it is not having any baked into the various courts in the game. The environments themselves look fantastic, from blacktops to wooden boardwalks and more, often with a lot of activity in the background from spectators to Ferris wheels to a river and plenty of other sights. It might have been neat however, if some of these had courts had unique powers that triggered (maybe a board falls out from under your opponent and they turn over the ball or a splash of water from the river blocks a shot - I don't know, I'm not the creative mind here), but it might have made the different courts even more unique from one another. NBA 2K Playgrounds 2 has a great presentation, a fun set of mechanics and a solid character progression system. There are microtransactions, as all sports games seems to be laboured with them these days, but it's nowhere near as intrusive as some other sports games I have played. However, without any statistical tracking, limited number of players on the court and only a handful of modes, that this title won't have quite the shelf life for me that a more involved simulation game like NBA 2K19.